The handle is riveted on. I believe new handle rivets are available. Lang's latest catalogue shows the ratchet pin, but no rivets. I'd also be interested in seeing how it's supposed to be. They are as Larry stated "riveted on". I believe I have several NOS handle pins - I'll check. To remove: grind off the riveted end, remove (drive out) pin & handle, replace spring into handle, replace handle pin, heat & pein over. Spencer, Larry says the handle is rivetted on. By that he means that the pin on which the sleeve rotates is rivetted over once it is passed through the handle. To get it off requires that the rivetted over end must somehow be ground off for the pin to be driven out. Then you have the problem of welding that pin length back again if a new pin is not available. I sense confusion! There is a "Z" shaped piece of "steel rod" that has a "handle" where your hand goes to crank, and, a "spring" that goes over the opposite end and slides back to where a bent end of it sticks into an aprox 1/8 in hole and serves to kick back the crank from the engaged position. After going through the engine mount, a collar with points on it called a "ratchet" slips over the end of the crank until the holes in the collar and rod line up and a pin is driven through and peened. Some people call the "handle" everything but the ratchet, while others call the handle just the part that fits in your hand. I don't think the ratchet pin is peened, it is designed with hole for a cotter pin. My 15 ratchet pin is fitted with a cotter pin and not peened. 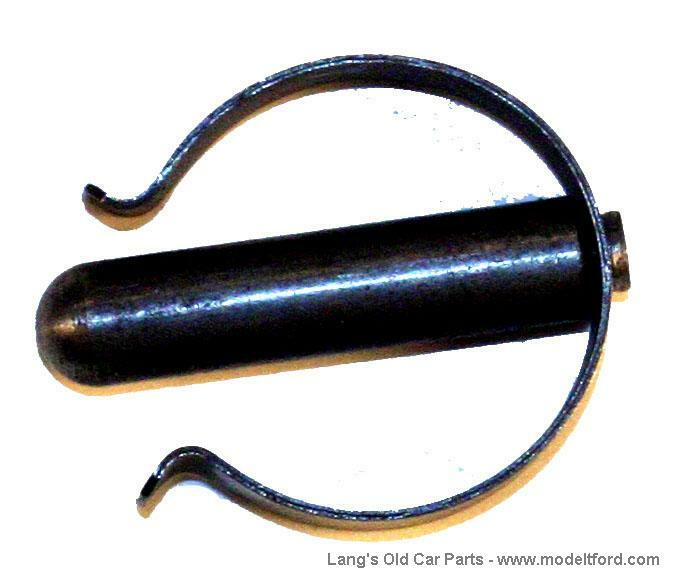 The replacement pin sold by Langs clearly has a hole for a cotter pin. It is very tight quarters and the pins (cotter and ratchet) are tough to get out. For approx. 1915 through approx. 1921, the hand crank assembly has two springs - one spring for the ratchet (which you referred to) and one small spring for the handle. The small spring pushes the handle sleeve forward on the handle bolt/rivet. One purpose of the spring is probably to keep the handle sleeve from rattling on the handle pin/shaft. Around 1922, the crank was re-designed and was one piece (two bends) instead of the previous design single bend with a crank handle bolt or rivet. You're right. The last one I removed had a bolt with lock washer and nut! I thought the pin through the swiveling handle part was a bolt, with a nut on the back end of it, and the peened ones were later. Mike B. -- The Z-shaped cranks are later for sure, as Erik said. The years we're talking about had an L-shaped rod for the crank, and the handle and its pin formed the rest of the Z shape. Well, Mike B's 6:54 post wasn't there when I posted at 7:22. Sorry to be repetitive. I've switched from Hotmail to Google Chrome, and it messes up the order of posts on the Forum threads. I need to refresh the page, sometimes several times, to get them in order. I'll ask Chris whether there's anything I can do about that. You are correct, Mike. Our '14 has a threaded crank for a replaceable handle. 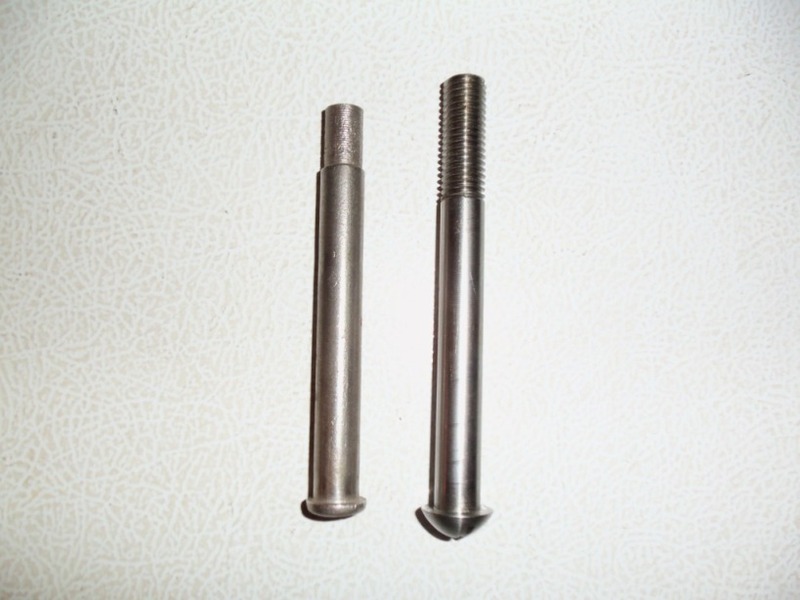 I have some new "early" long, domed, slotted head bolts/screws for attaching the early handles to the crank - I will take a photo tomorrow of the early style and a riveted style side by side. The crank ratchet pin WAS riveted until late teens or in the neighborhood according to available documentation. OK, here's a homework assignment for somebody who has all the parts in question: post pictures (not verbal descriptions) of what goes where. I said I would post a photo tomorrow. 1 1/8",part number was 527A, after 1910 the pins were 1 3/8" and part number 3905 was assigned. By deduction it would seem reasonable that the early 1 1/8" pins would have been riveted. From 1910 through to 1927 the pins were 1 3/8", an additional 1/4" added. Lang's, Mack's and Snyder's all show part number 3905 ratchet pin drilled for a cotter pin. It would seem feasible that the 1 1/8" pins were riveted however it doesn't seem feasible that the 1 3/8" pins were riveted. I wasn't around in 1910 so I don't know for sure but it just seems feasible. I have some bad news fellas. The ratchet end of the hand crank indeed had a pin through it but it was in fact PEENED OVER on BOTH ENDS to make the hand crank then more or less a permanent part of the pan until sometime in 1919. You rarely find this is still that way on early cars but it is a verified piece of research that both Trent Boggess and myself agonized over having to point out since we both realized it was not going to be a popular discovery. The threaded crank handle pin was used with a nut on the back side to hold it to the L shaped part until about mid 1909 when they shortened the pin about 3/8" and got rid of the nut but not the threads. The pin then was threaded through the L shaped piece and peened over on the back side. That stopped sometime in 1911 and that was when the slot on the end of the pin disappeared since the pin then was simply a press fit into the hole in the L shaped piece and the pin was still peened over on the back side. If you will forgive me for not having the exact dates on this for this posting, I am in the middle of something today but I have all the info on the pin and handle and the dates but that is the jist of it. Thanks John for the info. This is good information for the above people. I for one, will never use the peened over ratchet pin! There are too many times when the starting crank has to be removed to have to deal with that kind of originality! Case in point, have you ever replaced a fan belt without removing the ratchet? Oh yes, it can be done, but it's no fun. For that reason, I'll use the later style clevis type pin. A few pictures of this type crank would sure help those not familiar to understand this post. 1 1/16". From 09 through to 15 in my book and on to 1919 the cotter pin reference was deleted therefore this fits with the pin being peened. I can't figure why the additional 1/4" was added to the pin? From 1 1/8" to 1 3/8". I have a 1914 touring with an aluminum crank handle. The handle is worn on the front end and will pinch your hand if you don't wear a glove. The pin does not have a slot as shown in Steve's pictures above. How do I remove the handle and then what parts do I use to replace the handle? Does a 1914 have a spring on this front part of the crank handle? The pin in Erik's post looks like a great idea. It is, until the clip breaks and the pin falls out. VOE. Our '14 also has an aluminum handle and I don't believe it has the spring as the steel handle does. I've installed that type of "quick change" pin in all our T's. There is little to no wear on it as long as the holes are unworn in the ratchet & crank. I purchased an original untouched '13 motor years ago that had been pulled out of a wreck and stored in a barn. When I went to redo the motor I found that the ratchet pin had been peened over on both ends. Now I know why! Does that mean all those 100 point cars are only 99 points now? My unrestored '17 roadster has the peened pin. Dennis, in my experience, the crank handle which had the spring at the front of the sleeve was the type with the tapered cast iron sleeve. These came after the aluminium sleeve and before the thin rolled steel sleeve. I doesn't appear that the slotted head pin you have pictured has any shoulder where the threads begin. Is that the way that pin is made? Yes, that is the way they were made by Otis Clinton - R.I.P. 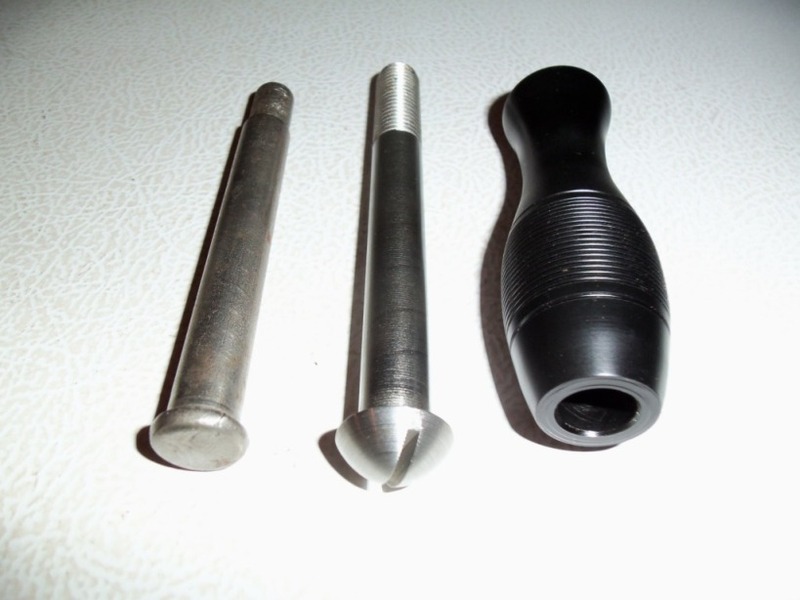 He owned a '10 that came from Harrah's and reproduced both the handle & pins (both shown above) which are of the length that takes the nut on the backside of the crank. I understand these were as close to the originals as possible. 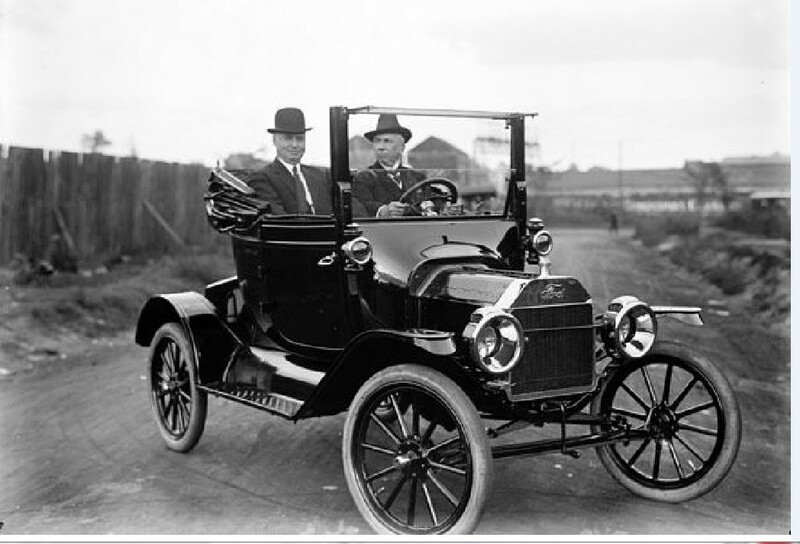 The easy-out pin is like some other common Model T accessories. The oil sight gauge and the fiber timing gear come to mind. Some folks use them for decades and never have a problem, but the potential for trouble is there and it does happen. I mentioned the spring breaking and the pin falling out because that's what happened to me. I didn't just make it up. That pin may be fine for most folks most of the time, but I'm staying with the original kind. I don't know how far into '14 they used the aluminum crank handle, but I doubt if it was very long. Larry -- The pic of the '15 Coupelet I sent you recently has that same shape of crank handle. (The pic might be of a prototype car, since it has carbide headlamps and E&J #6 cowl lamps.) The crank handle is black, so I don't know whether it's painted aluminum or some other material. Did they make that shape handle from something other than aluminum? In case some others are curious, here is that Coupelet pic. Don Watson sent it to me; it's one I had not seen before.